AMMONNEWS - Minister of Foreign and Expatriates Affairs Ayman Safadi on Monday warned that the failure of resolving the Palestinian-Israeli conflict based on the two-state solution remains the prime threat to stability in the Middle East. The foreign minister told a meeting of the foreign ministers of the EU and Arab League that Israel's unilateral measures, including settlements construction, undermine prospects for a two-state solution. He stressed that the meeting should send a joint message pledging commitment to working for permanent peace that turns the Palestinian people's right to statehood into reality. The minister hailed the EU's supportive stance of the two-state formula as well as the bloc's support to the United Nations Relief and Works Agency for Palestine Refugees in the Near East (UNRWA). In this context, Safadi urged continued support to the UNRWA to fulfill the refugees' needs and reaffirm that the refugee issue is a final status issue and must be resolved within a comprehensive solution. On Syria, the minister said a pan-Arab role is required to bring about a political resolution to the Syrian crisis according to UNSC Resolution No. 2254 to allow for the return of the refugees and safeguard their country's cohesion and territorial integrity. 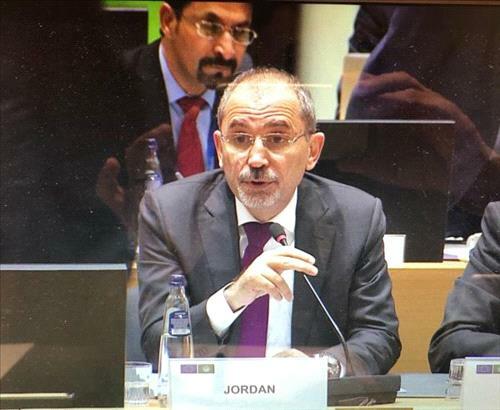 With regard to counterterror efforts, Safadi said the eradication of terrorism can not only come through military means, but also through targeting extremist ideology and ending crises and other underling causes. On the sidelines of the meeting, Safadi meet with a number of his Arab and European counterparts for talks on ties and international and regional issues. The minister also met with EU Foreign Policy Chief Federica Mogherini for a discussion on EU-Jordan relations and other issues including the UNRWA, a forthcoming London conference on investment in Jordan and a conference on Syria to be held in Brussels.